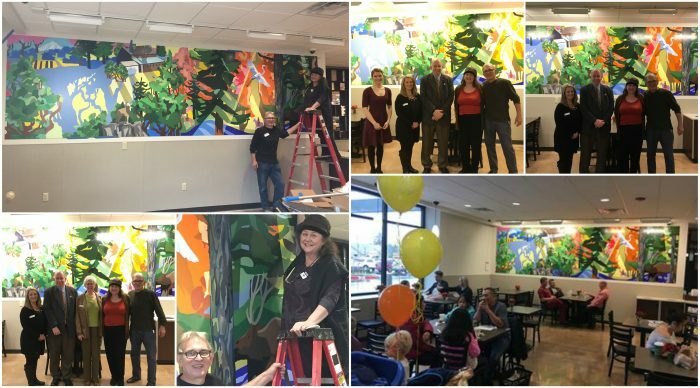 The mural within the new Happy Valley Fred Meyer was to be prominently displayed in the interior public dining area as part of the Kroger Company’s commitment to involving local artists in beautifying new stores. The chosen artists, Angelina Marino-Heidel and Joel Heidel, were asked to celebrate the spirit of community, unique identity of the neighborhood and its natural surroundings. In the mural, they embodied the store’s location perfectly, including Scouters Mountain, farm land/fields and even a view of Mt. Hood in the distance.